Folding electric bikes are the newest way to commute especially in vastly populated cities. Whether you want to run errands, commute to work or college or just go for a peaceful ride around town, a folding electric bike is what you need. Giving you a compact design and power in one great package, these bikes give you the perfect alternative to a car for regular commutes around town. The Prodeco V3 Mariner is the newest addition to the ProdecoTech Mariner family and is often regarded as the most compact and powerful folding electric bike out there. This glossy black and white beauty will turn heads as you ride it around town while giving you enough power to cruise without any worries. You can head over to Amazon.com to see the full feature list, or continue on our review where we look into much more detail at all of the features that set it apart from other folding electric bikes. Unlike other folding electric bikes, this bike can truly be called a folding bike due to its true compact design, greater adjustability, and lightweight. It doesn’t just fold down in half, but weighs only 42 lbs., 25% lighter than its competitors, making it easier to carry it around, take it on bus, train, plane, and subway, and store it wherever you want. The bike boasts a super lightweight, foldable aircraft grade aluminum alloy frame that is known for its lightweight, corrosion resistance, and toughness. In addition to the salt-air friendly aluminum features that make it great for cruising on the beach, the bike is equipped with a durable KMC Rust Buster chain made for smooth transitions and enjoyable rides. With full adjustability, the bike is suitable for anyone from 5’3” to 6’3”. To give you a smooth and comfortable ride, the Mariner is equipped with a front suspension fork as well as a suspension seat post, which smooth out all vibrations from bumps and potholes along the way. Plus, with the SRAM x7 8-speed rear derailleur and 8 speed twist shifters, it provides easy and smooth transitioning between gears, giving you one smooth and fun ride. In addition to that, you will simply love the Avid disc brake system that gives you incredible stopping power. Coming to the power of the Prodeco V3 Mariner folding electric bike, it boasts a powerful 300W free spinning motor, mounted on the front wheel that gives you 500W power at peak and maximum speed of 18mph, fast enough for cruising on the streets. The propulsion is a twist ‘n’ go throttle, which gives power on demand and is easy to operate. Just twist it half way and glide effortlessly around town. Or if you are in the mood to exercise, just pedal like you would on a regular bike. Since it’s so lightweight, you will have no problem in pedaling it. The 38V 9amp-hour lithium ion battery can take you to 25-35 miles in one charge. The lithium ion LiFePO4 batteries are more stable, charge quickly and do not deteriorate at higher temperatures. If a good battery is what you are looking for in an electric bike, rest assured that this one offers you just the best. This is the battery you can rely on. Most users describe this bike in one word: “nimble”. 1. The price is totally worth it. It is USA made and far better than Chinese crap usually found in the market. Everything speaks of quality. 2. The battery is surprisingly light; you will feel so nimble as if there is nothing at the back. 3. The speed is quite fast; one user commented that he could out-run a fast dog on a flat road. 4. It includes an LED tail light, which makes it great for riding at night. 5. This bike is very easy to assemble; it only takes about 15 minutes and you are ready to go. 6. The battery is good enough; plus, its lightweight so you can always pedal it home. 1. You should avoid hitting bad potholes and jumping curbs with it. 2. The battery is a bit tricky to pull out for charging. 3. Customer service is not very quick in replying to emails. Overall, this bike has more pros than cons, meaning users greatly love it. This one is an all-rounder when it comes to folding electric bikes. 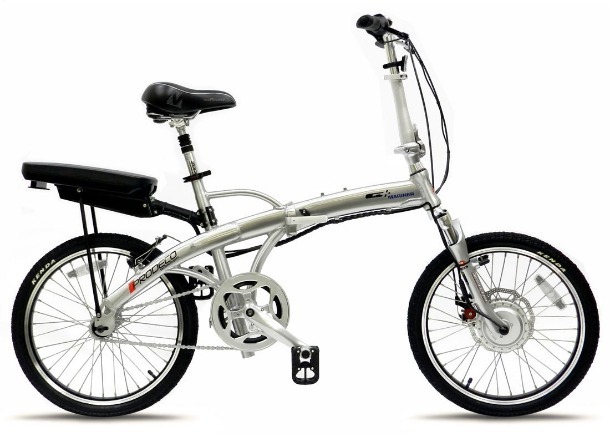 It truly gives you a compact and lightweight folding bike with a powerful electric system to take you around town and a good reliable battery to power up your commutes. If a folding electric bike is what you are looking for that is easy to carry around and store with a reliable electric system, the Prodeco Mariner is what you should be looking at.